For Autumn/Winter 17, Menswear and Womenswear are unified in a theme rich with Belstaff’s military heritage: the “Jolly Roger” naval and submariner inspired collection is both tribute and testament to the incredible clothing worn by the British Royal Navy throughout WWII. It had to endure the harshest of conditions while at sea, protecting sailors, boatswains and submariners alike, and it was upon the ocean that the genesis of the four-pocket waxed cotton motorcycle jacket was born. The collection then interprets the harsh realities of life at sea through colour, fabric diversity and an array of special vintage wax treatments for a worn-in look. Classic maritime silhouettes such as the pea coat and duffle coat have been faithfully reproduced in luxury Melton wool, while waterproof hand-waxed cotton and leather reinforce the stylish functionality of naval outerwear. The parka plays an integral role this season, emphasised by a technical foul-weather version based on a Belstaff archive piece that was created for the military in 1960. Sharing the same colour palette across menswear and womenswear, this season focuses on industrial tones of red, brown, blue and military green, particularly throughout Belstaff’s core pieces. Charcoal grey, black and true navy form a base from which emerge brighter hues such as spruce teal, sanderling, cardinal red and burnished gold. In leather and waxed cotton, colours have been given an aged effect for a unique patina. Much brighter and more vibrant colours are found in the naval tattoo motifs which add a personalised touch. To recreate the mood of life on the ship or in the docks, models are positioned at varying heights in front of large metallic cylinders around the presentation space. Belstaff is a modern British heritage brand steeped in the spirit of adventure, protecting independent spirits to venture free. In Belstaff, the fearless explorer and the stylish alike will discover clothing for a contemporary lifestyle influenced by Belstaff’s rich 93 year history, yet firmly rooted in the present and forever forward-looking. The parka is a key piece for the season and arrives in a variety of styles across men’s and womenswear. The emphasis centres on an incredibly protective foul-weather parka which is a contemporary reproduction of a jacket made by Belstaff in 1960. Made from down-filled ballistic nylon (originally developed as a material for flak jackets for WWII airmen) exclusive to Belstaff and with a down-filled hood liner, it is supremely functional and constructed to stylishly withstand the very worst of the elements. A shorter four-pocket vintage waxed cotton parka with a slanted chest pocket also takes its cue from a submariner’s two-piece suit developed by one Captain George Phillips in 1937. Belstaff honours the sartorial military tradition this season by faithfully recreating classic pea coats and oversized duffle coats in luxurious wool and crackled vinyl. Traditional pea coat details such as the slash pockets and wide lapels are present while in the women’s versions, subtle leather details such as latches and buttons have been applied for a contemporary twist. An Officer’s coat with dulled silver naval buttons appears for women, whilst the classic Milford coat (originally designed for Sherlock) has been updated with the same naval buttons for men. Belstaff’s leather innovation continues for AW17 as it is presented in a variety of weights, finishes, colours and styles. For men, the overarching theme focuses on a well-worn patina for a very lived-in effect. Seasonal colours have also been introduced to Belstaff’s core leather jackets. In women’s leather, there are two very notable additions showcasing Belstaff’s fabric innovation: the first is an incredibly lightweight down-filled leather blouson and the second is a machine-washable nappa leather jacket. Crackled vinyl-effect leather is a stylistic innovation in women’s. Shearling pieces, many of which are opulently reversible, form a key part of both men’s and women’s outerwear this season due to their incredible warmth and luxurious tactility. Other leather jackets feature emblems on their backs, ie the Jolly Roger in women’s and the Belstaff ship in the men’s. 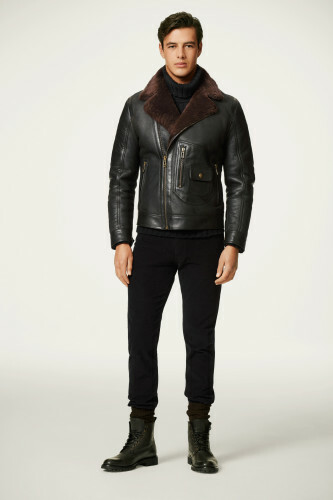 Belstaff has released a new Aviator silhouette for men’s AW17 that stays true to the classic flying jacket style while complementing it with a more contemporary and wearable aesthetic. Rather than the typically large shearling collar, some styles will feature a more subtle shirt collar in corduroy for seasonal versatility. They are available in a vintage-effect hand-waxed cotton, hand-waxed leather or burnished suede. This season’s collection is notable for a host of new and special vintage treatments which have been used to reinterpret the weather-beaten outerwear worn by naval sailors during WWII. The combination of sea water, air and repeated wax coatings created an almost matte finish to these garments and so Belstaff has reproduced that effect across a number of jackets. One such fabric is a waxed cotton and has been washed many times and then re-waxed by hand with a special black-tainted wax. Other treatments include a waxed canvas that has been combined with a beautiful hand-waxed leather, while an 8oz canvas has been coated to create a muted leather-like shine for a vintage look. Tattoos have always been a naval tradition, not just in the British Royal Navy but also in the US Navy. Belstaff have incorporated this heritage of symbolism in two distinct styles. The first is a more edgy reproduction of classic naval tattoos such as the swallow (which signifies a sailor accomplishing 5000 nautical miles out at sea) and the anchor. Placed randomly across a variety of garments, they have been designed in the rich and vibrant style of “Sailor Jerry”, a prolific tattoo artist who etched his trade in the red light district of Honolulu during WWII. These motifs have also been extrapolated to form a more feminine lace-like graphic resembling body art. Lastly, the iconic Jolly Roger flag, which was raised by victorious submarines on their return to harbour has also been applied to elements of the collection. Tattoo emblems and the Jolly Roger appear across men’s and women’s on leather, wax, knitwear, sweats, tees and shirting. Men’s footwear comes in the shape of a Chelsea boot and a combat boot, both in a clean calf leather with lug sole. For women, two new bag shapes appear: a small cross-body and larger hobo with adjustable strap, both with naval roping details and large hooks.